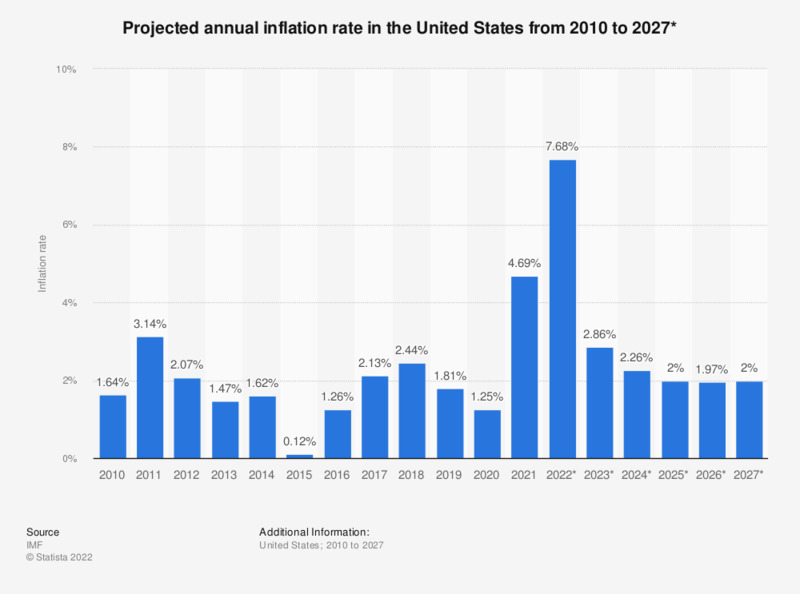 This statistic shows the annual inflation rate in the U.S. from 2010 to 2017 with additional projections up to 2023. The data represents U.S. city averages. The base period was 1982-84. In economics, the inflation rate is a measurement of inflation, the rate of increase of a price index (in this case: consumer price index). It is the percentage rate of change in prices level over time. The rate of decrease in the purchasing power of money is approximately equal. According to the forecast, prices will increase by 0.87 percent in 2017. The annual inflation rate for previous years can be found here and the consumer price index for all urban consumers here. The monthly inflation rate for the United States can also be accessed here. Inflation is a term used to describe a general rise in the price of goods and services in an economy over a given period of time. Inflation in the United States is calculated using the consumer price index (CPI). The consumer price index is a measure of change in the price level of a preselected market basket of consumer goods and services purchased by households. This forecast of U.S. inflation was prepared by the International Monetary Fund. They project roughly a 2 percent annual rise in the general level of prices until 2017. This means that a product bought today for about 100 U.S. dollars will cost about 102 U.S. dollars next year, and so on. Considering the annual inflation rate in the United States in recent years, a 2 percent inflation rate is a very moderate projection. Although the moderate inflation of prices between 2 and 3 percent is considered normal in a modern economy, countries’ central banks try to prevent severe inflation and deflation to keep the growth of prices to a minimum. Severe inflation is considered dangerous to a country’s economy because it can rapidly diminish the population’s purchasing power and thus damage the GDP .